TEPCO’s worst-case scenario (here and here) pales in comparison with the analysis by the Institute of Applied Energy, also presented on November 30 at the workshop held by the Nuclear and Industrial Safety Agency. The analysis done by the Institute of Applied Energy commissioned by the national government, 85% of fuel dropped to the Containment Vessel in Reactor 1, and 70% of fuel dropped to the Containment Vessels in Reactors 2 and 3. The researchers at the Institute pointed out the possibility of the damage to the stainless-steel shroud that surrounds the fuel core, and of the corium having eaten away the concrete floor of the Containment Vessel up to 2 meters deep. Because of that, they also said it was possible that the RPV got tilted. Yomiuri doesn’t specify which Reactor the Institute of Applied Energy was talking about, but my guess is Reactor 1. Some nuclear experts have suggested that if the corium had escaped from the RPV it would spread out flat and evenly on the pedestal and be easily cooled by water. 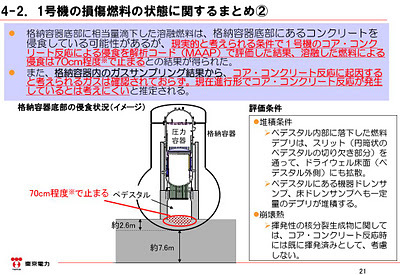 Well, even TEPCO admits that may not the case as far as the shape and the location of the corium is concerned (they do say the corium is cooled), and the Institute of Applied Energy says the corium could be 2 meters deep into the concrete. My totally amateur 2 cents are that the concrete foundation may have cracked in the earthquake, and that it is possible that the crack or cracks are there in the pedestal. So, even if the corium wanted to spread out thin and flat, it would find those cracks and go there. Once the core-concrete reaction starts, it would be a positive feedback loop; the temperature gets higher not just from the contact with the corium but from the core-concrete reaction, the hole in the concrete would get bigger, and more corium would go into the bigger hole. I urge those peoples to contact the C.E.A staff; in order to have acurated experts,TEPCO staff 9 month later, does ‘nt seems so acurated to manage such situation; which to me as “Nuke veteran french essays”, give me somes experiences in that matter…. polution with nuclear elements in the ocean will be a drama later on mankind and sea species will be eradicated +++ populations deseases (225 pathologies potentialy)….You better figured out properly the consequances in the futur we all can get…..